It's easy to see how clean the sliver is on the right with all of the waste fibers removed-- it's also easy to see the "jumbly" nature of handcarded fibers (along with shorter and longer bits and bumps) as well. I prefer a smoother fiber prep (using combs)-- but combs aren't always going to produce exactly what you want, either. Notice how the sliver gets darker towards the center? The Romeldale staples were grey and white... apparently, the whiter fibers in the fleece were longer than the grey and pulled off the combs first. Even after I planked and relashed the straightening combing back on for additional combing, the fibers again pulled off white to dark. So I ended up with a few rolag-to-rovings and a spectrum shaded sliver (five times fast!)... 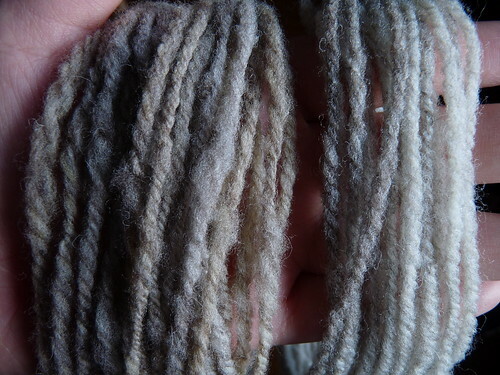 for fun I spun each on a spindle and navajo plied, just to keep the color gradation intact. I honestly don't think one is better than the other-- I like how airy the carded prep spun and its rustic, evenly colored look, and I also like how smooth and effortless it was to spin the combed prep. 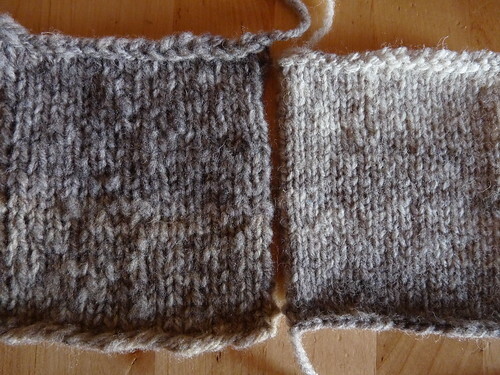 It is just kind of fun to see the difference, same fiber in but two different swatches out. I steamblocked these instead of wet finishing, I think the carded prep may look even more cohesive once wet blocked. Looking closely at the carded swatch, you can see towards the center where I changed rolags and one was browner/less grey than the other... small batch even blending can be difficult on both handcards and combs. 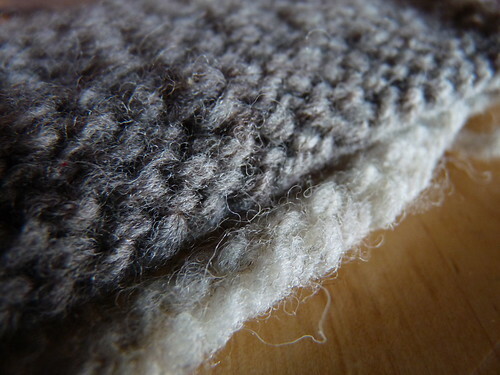 Best of all though is the light to dark transition the combed swatch takes, with the bulk a mix of white and grey. 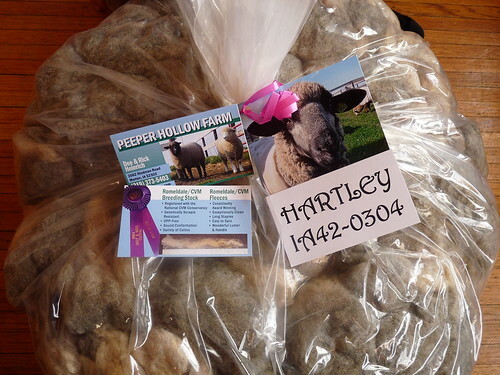 I buy fleeces with the longrange intention of spinning for a sweater with them-- but not variegated sweaters. 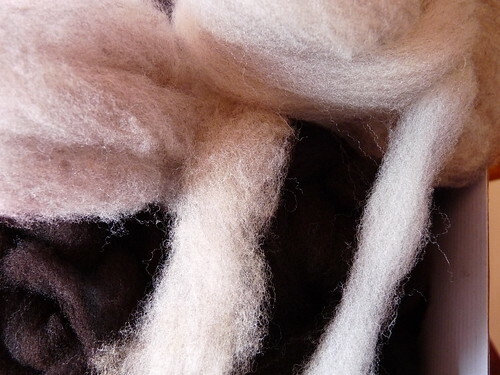 Sampling like this has given me a few insights: I need to practice more on the handcards because I don't know if it's me or the technique that is the problem when carding out a reasonably smooth rolag/roving from fleece. 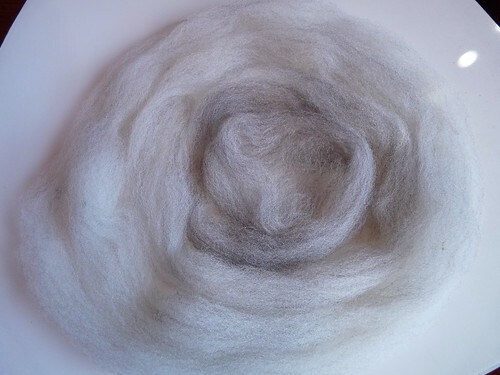 I also am now considering how to deal with spectrum colors in this Romeldale sliver-- I could separate the white from the grey when pulling off of the combs, leaving me with two distinct colors from one fleece. I could also try and handcard the slivers pulled off of the combs for an even color, maybe eliminating both the problem with waste/bumps and uneven color. I love you blog already but this is definitely one of my all time favorite posts, thanks for sharing your insights! Yay for wool!! I love the subtle gray stripes SO much! Are you sure you don't need a natural, very subtly self-striping sweater? Maybe just a stripey or fair isle yoke? Thanks for sharing your processes. I love reading your blog! Your writing and photos are very inspiring. Wow thanks for sharing. It surely is worth knowing these little differences. 1) No matter what, the longest fibers will always pull off ahead of the shortest. Planking doesn't somehow magically circumvent this "problem." 2) The work of recombing generates a tich more waste and is a lot of work for (imo) a marginally better top. I decided it wasn't worth the effort. 3) Tangential - I almost never recomb the waste on the comb. True, I can recover quite a bit of useable wool, but top made from initial waste - even when planked and recombed - has a noticeably different feel than virgin combings (shorter, coarser fibers in recombed waste). I am enjoying watching you explore the process! Thanks for the review on the wool scour, too, I am expecting a giant load of Romney soon (going to have a mattress pad made for my king size bed). I was planning to wash it myself to save some $. Wow...so informative!! I have not tried combing yet but this was a great intro into the differences! I think a striped sweater would look great! I love natural colored yarn. I just wanted to drop you a comment, I've been reading your blog for a long time and just got my first half-fleece and your blog has proved very helpful for how to process it properly. Thanks so much for keeping up your blog and posting so much helpful info. We are offering Cotton Waste in the international markets that is obtained from superior grade cotton material.